Another magical autumn morning on The South Downs. Do Monkey Puzzle trees grow wild in the UK? Now here’s an odd question. Are Monkey Puzzles an invasive species colonising the English countryside? Do they self seed or do they need someone to plant them to become established? At the weekend I took a trip over to Winkworth Arboretum near Godalming in Surrey. My 9 year old son is becoming a skilled photographer and we decided to head out at dawn to capture the autumn colours in the magic hour! Winkworth is a fantastic location for autumn colours and this year has to be one of the best autumns for a long time. Last week I took an early morning ride along The South Downs Way and then to the oil fields in Singleton forest. Tucked away on the Cowdray Estate, off the beaten track and behind a simple fence in a field of cows is the magnificent “Queen Elizabeth Oak”. A mighty remnant of the Middle Ages, this Sessile Oak is estimated to be between 800 and 1,000 years old. It’s the beginning of ‘free fruit season’! 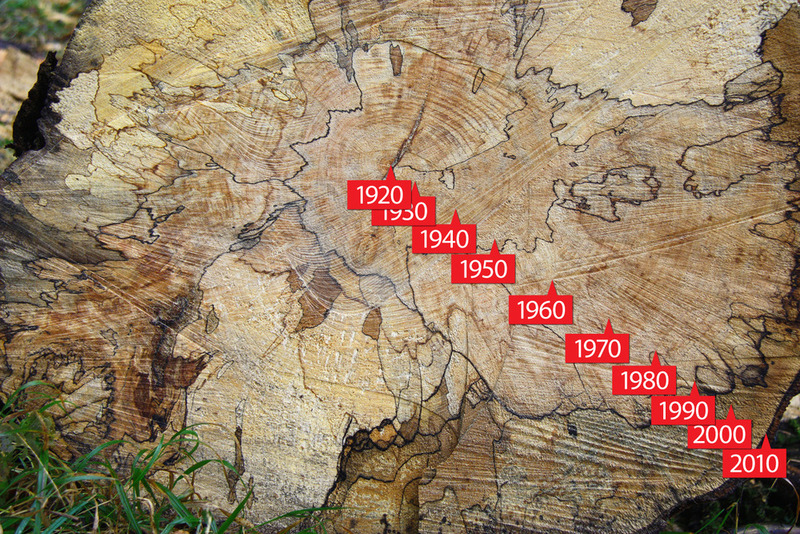 How old is our Beech Tree? A while ago a beech tree blew over across the footpath on the way up to Linch Down. And a little while later someone came along and kindly chopped it up with a big saw! What do Wild Damsons look like? 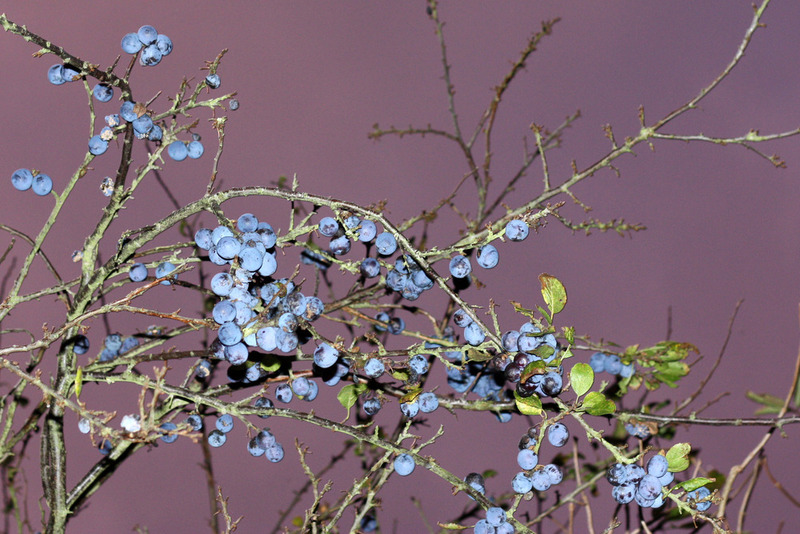 So here’s a good question… what do wild damsons look like? Well here’s a good answer.. they’re about the size of a large grape and have a dull mauve skin. And as with all things tasty that grow in trees, the best ones are always out of reach! It’s been a great year for fruit in the hedgerows, so I just couldn’t resist picking some Wild Damsons as there were literally thousands of them overloading a tree near our house. My logic for picking them was that it seemed wrong to let such fine fruit go to waste! Naturally I considered making either jam and chutney, but with a little persuasion I agreed to make some Damson Vodka… Damsons are a bit like Sloes, just sweeter and larger and more suited to Vodka than Gin. A typical Damson is about 20-30mm long and slightly rounded, with a skin that is often a dusky matt purple colour (see the photo above). A quick search on Google revealed a wide range of recipes for making Damson Vodka, so I’ve created an ‘average’ recipe from all of them and will see how it goes… I’ll let you know! I gave all my Damsons a good wash, and then put them in the freezer. Freezing them splits the skins, plus there are lots of great rumours about freezing improving the sweetness of the fruit. Not sure if that’s true though! Defrost the fruit and put it in the sterilised jar. Add the sugar and vodka, taking care to fill the jar nearly to the top (air can make the fruit go off). Give it a good shake, put it in a dark place, and shake it every day for about 3 weeks. Here’s the tough part. The broth now needs to be left for about 6 months to mature. After about six months, the liquid can be strained through a muslin and decanted into bottles. Try a bit at this stage and decide if it needs more sugar… And here’s the REALLY tough bit! The Damson Vodka should now be left for another 6 months! At the weekend we were taken to a small corner of Sussex that’s home to one of Britain’s most celebrated trees… And here she is, in all her glory! Tucked away on the Cowdray Estate, off the beaten track and behind a simple fence in a field of cows is the magnificent “Queen Elizabeth Oak”. A mighty remnant of the Middle Ages, this Sessile Oak is estimated to be between 800 and 1,000 years old. To put this in context, this tree was already 500 years old when the Cowdray Estate was first established back in 1532. 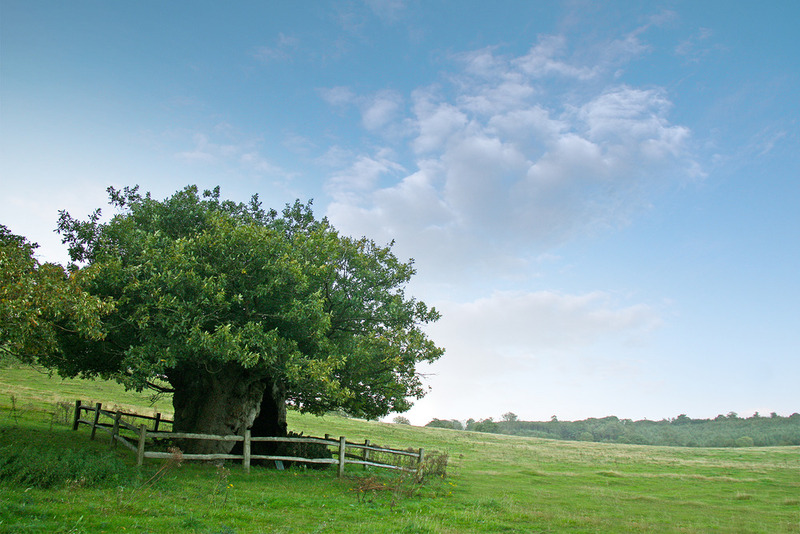 Now this tree may not look like your typical mighty oak, but in 2002 she was ranked as one of the top 50 Great British Trees – plus she’s rated as one of Britain’s Top 5 Oaks! She’s a pollarded tree (which means in her early days her height was stunted by having the top cut out of her), and whilst she isn’t very tall, she’s managed to get very, VERY big around her bottom! In fact, she has a massive girth of 41 feet! The tree is hollow with space enough for ten people to squeeze inside. And if legend is to be believed, Queen Elizabeth I took shelter from the rain here during a visit to the estate in 1591, hence the name. Browsing around on the web I also came across this photo on The Ancient Tree Hunt website. It dates back to 1910. 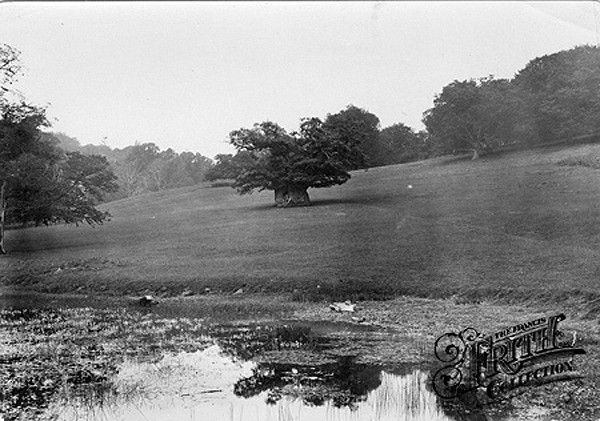 It’s an Edwardian postcard from the Steve Young Collection, and shows how the shape of the tree has changed in the last hundred years. Six months later, and quite by chance I stumbled across a website called Francis Firth where you can buy and view old photos and postcards. 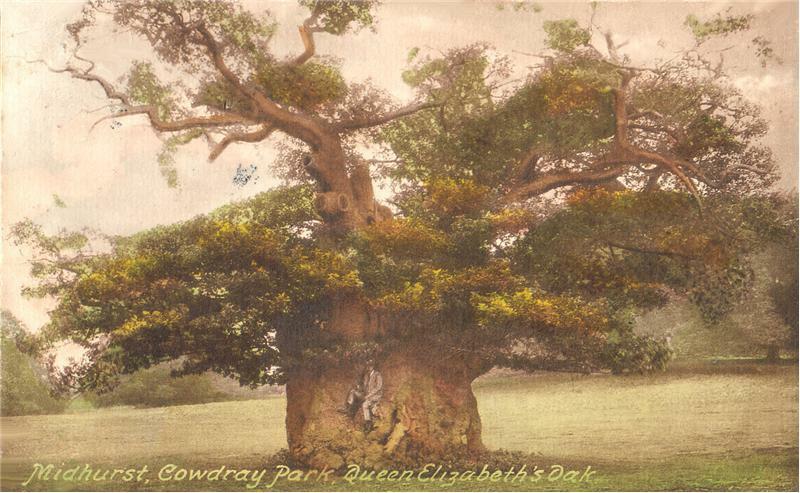 There’s even a picture of the Queen Elizabeth Oak like this. More thanks to Andy G for leading us to this amazing tree.